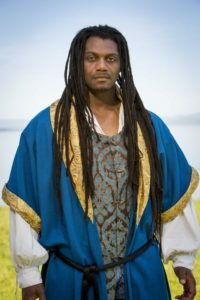 That Dameion Brown turns in an impressive performance in his professional debut, and in the challenging role of Othello at Marin Shakespeare Company no less, is almost beside the point. His performance is less important than what he represents as he makes history. Brown, you see, is only a year out of prison after 23 years behind bars. His training is a result of Marin Shakes’ Arts-in-Corrections program under the direction of Managing Director Leslie Currier. His only previous experience was as Macduff in Macbeth in a production at Solano State Prison. Dameion Brown as Othello. All photos by Steve Underwood. If you knew none of that, and watched Robert Currier’s production without any context, the surface appearance was that of a fairly ordinary production of Shakespeare’s tragedy. Marin’s approach to conceptualizing and design has usually been conventional, and always a little “rough” in Peter Brook’s appreciative sense. This production is no exception. It is set in period, with fairly low-budget set and costumes; interpretively uncontroversial. Knowing Brown’s story, however, one cannot help but view this production through the filter of one’s knowledge of our dysfunctional criminal justice system, its disproportionate effect on men-of-color, and the growing frustration (at least in liberal enclaves like the Bay Area) that unjust scapegoating has become so systemic that it may be a bigger problem than the problems corrections supposedly correct. By making the brave decision to cast Brown, and to highlight his incarceration record rather than downplay it, the production instantly brings us into dialogue with Shakespeare in an almost visceral way. Nothing special needs to be adjusted to make clear the “othering” of Othello, the casual dismissal of everything good about him, while social prejudice insidiously makes all plots against him easily accomplished. Brown’s presence is statement enough. It also reminds us of why drama can be so central to social discourse. Brown is, after all, an example of rehabilitation. Example shows us some paths forward that are not about locking young men-of-color up and throwing away the key. “Law and order,” so much a topic of this year’s election season, suddenly seems to be a less automatic pairing. I liked this production, without finding it revelatory about the text. (For contrast, here is a review of a production of Othello by the Arabian Shakespeare Company from 2014 of a production that I did find illuminating. By the way, ASC company has a forthcoming Macbeth that I am itching to see already.) What I think Marin does especially well, however, is have a sense of the current moment that – like a Rorschach inkblot – pulls the submerged ideas out where they can be examined. Last summer their Richard III was positively Trumpian without resorting to any obvious imitation or parody. This Othello is just as current and unnervingly relevant. That is the result of deepest values of the company, like the long-term commitment to Arts-in-Correction and the successfully empowering Brown to see his own possibility, not to pasted-on references that make it temporarily topical. They do not so much uncover new aspects of Shakespeare’s plays as simply lay them bare, in the right context and at the right time. That is not to say that there was not was much to admire in numerous performances, in addition to Brown’s. Company stalwart Cassidy Brown, cast almost ridiculously against his usual comic type, is a fine Iago and a heroically supportive stage partner. Luisa Frasconi, despite being dressed in Renaissance costume, brings an attitudinally contemporary edge to Desdemona that fits well with the play’s context. Elena Wright, usually a leading lady, is powerful as Emilia. Currier’s staging was clean, efficient, and communicative. Luisa Frasconi as Desdemona with Dameion Brown. When all is said and done, however, I think that most of the audience seemed less focused on what they were seeing onstage than what they were seeing in themselves. Isn’t that what theatre is supposed to help us do? Admission at the door is $35 general; $32 senior; and $10 youth (25 and under). Preview performances are $12 per person. “Pay Your Age” is offered to audience members between the ages of 26 and 34 when purchasing tickets at the Box Office on the day of any performance, with valid identification. Marin Shakespeare Company also offers those 65 and over half-price tickets at Senior Matinees and those ages 18 and under admitted free at Family Matinee performances. 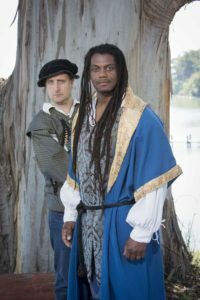 You are currently reading Till fit time call thee to answer: A Review of OTHELLO at Marin Shakespeare Company at Shakespeare's Tribe.